An evocative, beautifully imagined and heart-wrenching wartime story by celebrated author Timothee de Fombelle. 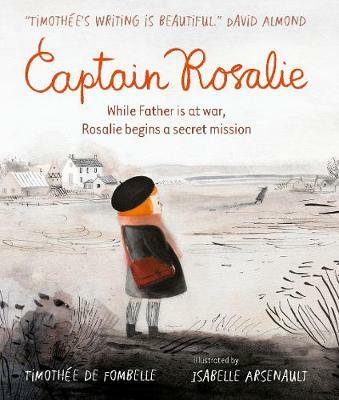 In this astonishingly-drawn wartime story, a little girl called Rosalie is a captain on a very secret mission - a mission to learn how to read. Mother reads often to Rosalie, especially when Father sends them letters from the front line describing the forest in the distance, the churned-up soil and the soldiers hiding in holes. But as Rosalie gets further along in her mission and begins to piece together the words in her father's letters, the truth about the consequences of war are finally and irrevocably revealed. Timothee de Fombelle is a much-admired French playwright, as well as the author of award-winning fiction. His first series, Toby Alone and Toby Alone and the Secrets of the Tree has been printed in 27 languages and has won numerous awards including France's prestigious Prix Sorcieres and the Marsh Award. Timothee's adventure series, Vango, Book One: Between Sky and Earth and Vango, Book Two: A Prince Without a Kingdom received huge critical acclaim, and book one was granted an English Pen Award for translation. Timothee's beautiful story, Captain Rosalie was first featured in the acclaimed collection The Great War:an Anthology of Stories Inspired by Objects from the First World War. Timothee lives in Paris. Isabelle Arsenault is a Canadian illustrator who has won an impressive number of awards and has achieved international recognition. Her books include Migrant by Maxine Trottier, a New York Times Best Illustrated Children's Book and a finalist for the Governor General's Award; Once Upon a Northern Light, written by Jean E. Pendziwol; Jane, the Fox and Me, written by Fanny Britt; and Alpha. She lives in Montreal, Canada. Find Isabelle online at www.isabellearsenault.com.